A RAINBOW AT NIGHT: We've all seen rainbows--bands of colour arcing across the sky after summer rainstorms. But how many of us have seen a rainbow at night? "I have," says Chad Blakley of Lights Over Lapland. 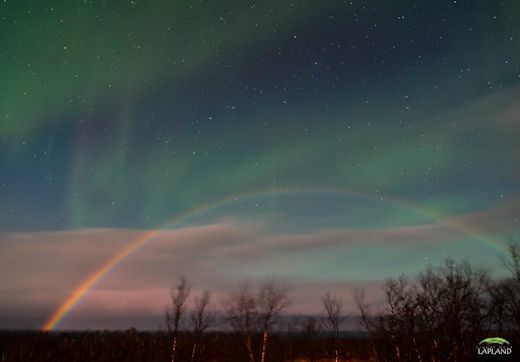 "We saw one just last night in Abisko, Sweden." 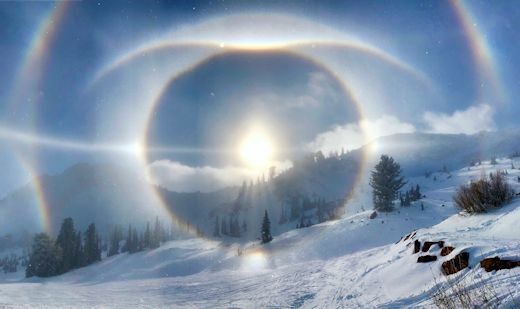 INCREDIBLE SKI HALOS: Ski resorts are one of the best places to see sun halos--rings of light that surround the sun when ice crystals fill the air. Spaceweather.com reader Julie Morris was skiing at the Snowbasin Resort in Huntsville, Utah, on Nov. 25th when she witnessed this incredible specimen. Looking good for my guess of 220 spotless days, just need another run like the last without any TINY pesky spots spoiling things!!! The thermosphere climate index isnt updated yet, still on 1st december. With kp index low, continuing sunspotless activity and low sfu, im guessing thermosphere temps down to 3.68 billion watts. Getting very close to that all time record low set in february 2009. 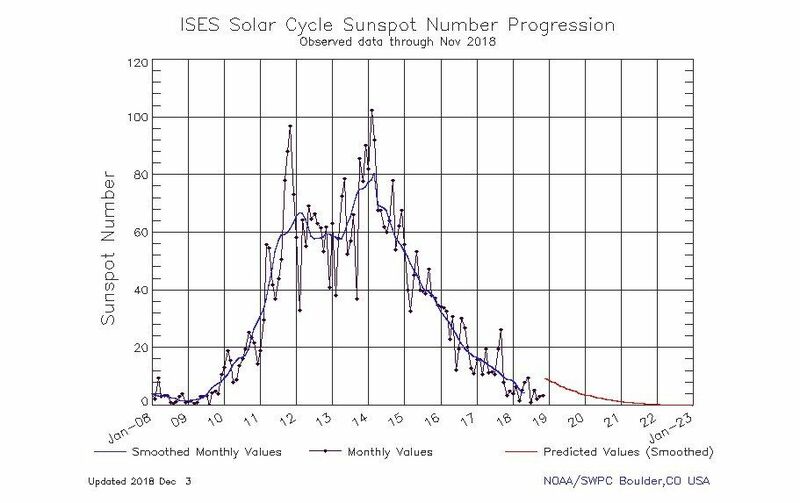 210 sunspotless for 2018 looks possible, 2019 even less sunspots. At current run rate of 59-60% spotless that would perhaps mean 220 spotless days. I'm not sure if there's any way to predict frequency or likely development of sunspots, but theoretically could be higher still percentage wise. 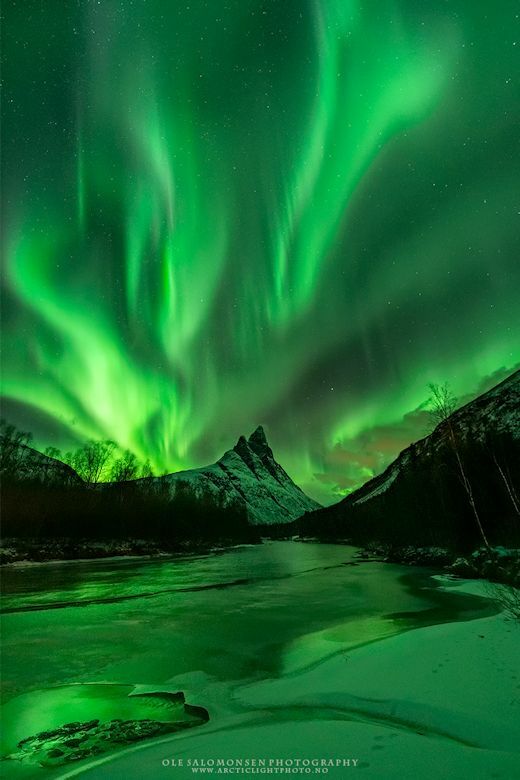 Polar auroras turned the Northern landscape green. New solar activity forescast and it’s quite shocking. When or where is cycle 25? The thermosphere contains less that 0.01% of the Earths air, despite ranging up to 1,000km in thickness. The air there is so sparse that most of it is considered outer space, and even when it's over 2,000C, you'd freeze because there not enough air to conduct the heat. As such, there's no known link between temperature variations at that elevation and weather at the surface. Not sure what method is being employed there. SIDC use a couple of methods which have very different forecasts.